Sigils Ice is on an ecru warp with a turquoise blue weft. 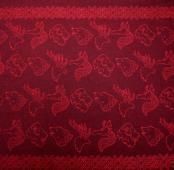 It is 100% Combed Cotton, 245gsm and in our 'Snug' weave. Ice is soft and easy to wrap with from the start. It is supportive and has nice bit of cush. 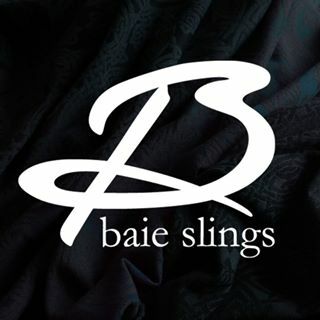 This photoshoot had a guest appearance from our original Baie Slings model. Sometimes 4 (nearly 5!) year olds want to go up more than adventurous toddlers! Sigils Unburnt will be available on our website shop from Thursday 23rd February at 7pm GMT. 'Unburnt' has an ecru Cotlin weft on our rusty orange to reddy-brown gradient warp. It is 79% Combed Cotton, 21% Linen, 267gsm and woven in our 'snug' weave. It is very sturdy and though soft and pliable from the start it will soften up more with some use. It's high time for a new Sigils colourway! How about something Golden? 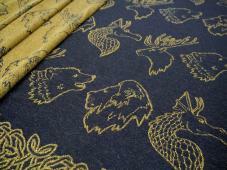 On our super dark navy blue warp, practically black with a blue hue, the golden weft really shines through on the dark side with the golden animals. As Sigils is a pattern we enjoy to experiment with colourways-wise this is only a small run and we will release these wraps as a draw to purchase. Golden Sigils is 100% Combed Cotton, 267 gsm, with our snug weave. We noticed we've passed 5,000 likes last night! We have something special planned to mark this milestone. We thought we still had a bit of time though and we don't want to leave you hanging about Crimson Sigils! So we will save the celebrations for a few days. 79% Combed Cotton, 21% Linen. 315 gsm, though doesn't feel heavy in hand. With the denser 'snug' weave and the linen content this wrap needs some 'breaking in' but does become soft with use. It is very strong and supportive, and 100% toddler-proof. 'Sigils' is inspired by fantasy and mythology. Designed by Juliette Daum. More photos including a flat shot on our website in the shop. This is a very limited release with only enough fabric to make a handful of wraps (but don't worry more Baie Linen blends are coming in other designs!). 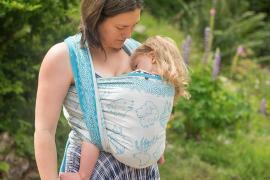 Like a sandy bay hugs the sea, our woven wraps and slings are designed for you to carry your baby safely and snugly. We work with our local weavers in Yorkshire, England to create soft and strong natural fabrics perfect for baby-wearing. 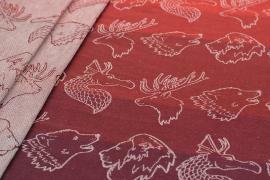 As a family of artists it is our vision to create beautiful artworks and stylish patterns on our wraps. We design each fabric so the images, flow and space in each pattern take on a completed form when wrapped around you and your baby. 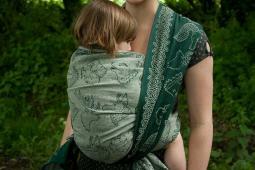 Each wrap is carefully sewn by Juliette who is a very experienced seamstress and babywearer. We also design and sell accessories, such as hats and cowls in the same material to match your slings to wear whilst you're out showing your baby the world.